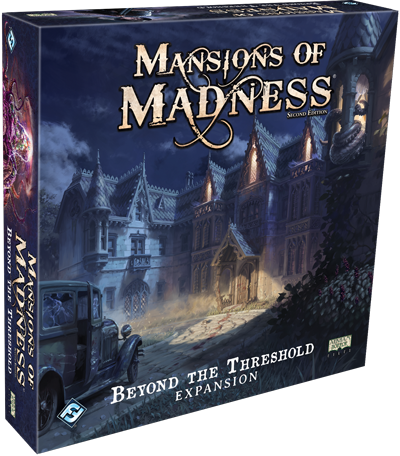 The horrors of Arkham continue to haunt you in Beyond the Threshold, the first expansion to Mansions of Madness Second Edition from Fantasy Flight Games. Featuring two new investigators, one new monster type, and dozens of cards and tokens, this expansion integrates seamlessly with the existing components and scenarios. These components introduce both new gameplay elements and unique insanity effects for the investigators who were unable to bear the terror. Two brand new scenarios will become available with Beyond the Threshold, leading to countless hours of suspenseful investigation and thrilling terror. Pick up a copy of Beyond the Threshold at your local retailer, then update your Mansions of Madness app to access the new scenarios, Vengeful Impulses and Gates of Silverwood Manor.